Bumble has announced the launch of ‘Bumble Mag’, an offline publication produced in collaboration with Hearst. The magazine becomes available nationwide in the US today. Its content mirrors the in-app interface to an extent, with sections including ‘You + BFF’, ‘You + Dating’ and ‘You + Bizz’. Early contributors include Serena Williams, Erin and Sara Foster and a raft of female entrepreneurs. The cover of the first issue sees Lauren Chan, Founder of fashion brand Henning (provider of “Fashion-forward workwear in sizes 12 and above”), pose in yellow on a Bumble-branded backdrop. HearstMade’s Editorial Director, Brett Hill, saidl in a statement: “Bumble is at the forefront of inspiring women to make connections and take initiative in all aspects of their lives with its positive message of empowerment. 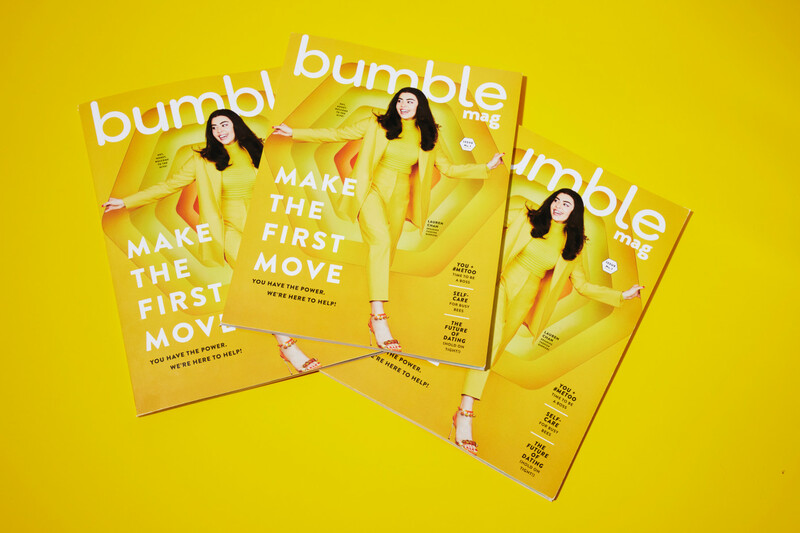 The first edition of Bumble Mag will be distributed by the platform’s brand ambassadors, and users who request a copy via an in-app prompt will receive one for free. The magazine will be monetised via advertisements, though Bumble has noted it will be selective in its partnerships. 150,000 copies of the first issue are reportedly in circulation.